DALLAS, TX -- The North American Hockey League (NAHL) went and did it again and keeps raising the bar and setting the standard for junior hockey in North America. For the fifth straight season, the league has set a new NCAA commitment record, this time with 331 total NCAA commitments during the 2017-18 season. That also includes a new record total of 229 NCAA Division I commitments this past season. On top of all that, NAHL teams did it with one less team than the season prior. It once again re-emphasizes that no other junior league in the world saw as many NCAA commitments for their players, while they were actually playing in the league. 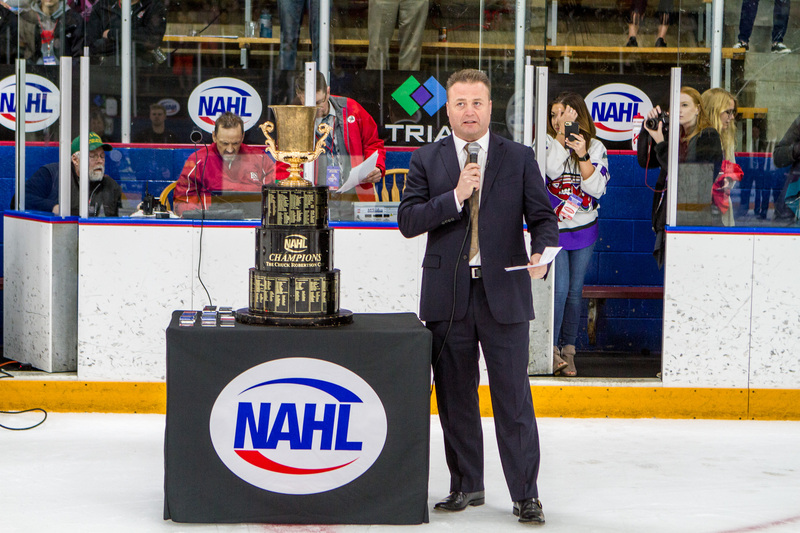 NAHL Commissioner and President Mark Frankenfeld could feel momentum building within the North American Hockey League several years back. The snowball has only grown, and now the league finds itself in a better place than it’s ever been in 44 seasons of operation. 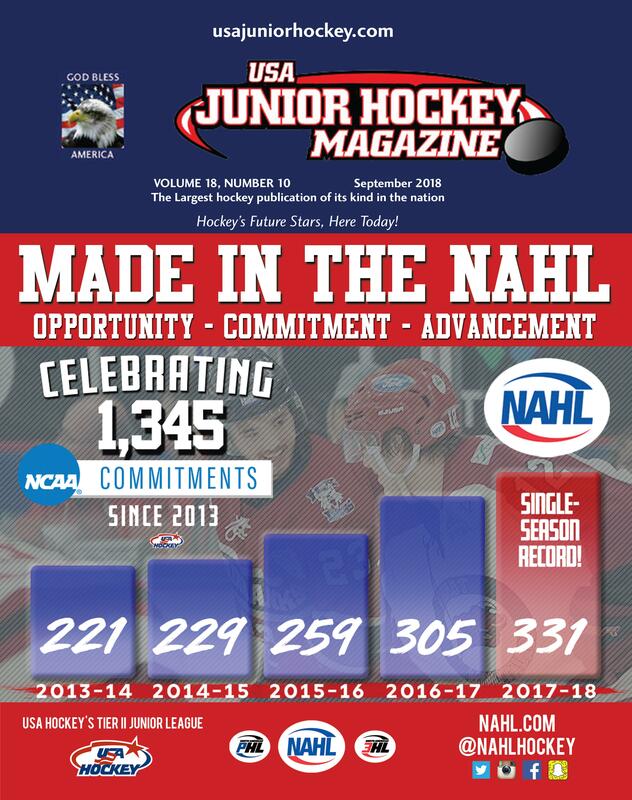 The commitment record is part of an ongoing and rising development path that has seen 1,345 NAHL players make NCAA commitments during the last five years. In addition, 25% of freshmen that played NCAA Division I hockey this past season were alumni of the NAHL. One of the more impressive things about this year’s commitment numbers is over half of the NCAA commitments made this season came following the NAHL Top Prospects Tournament in late February. Heading into the event, the league had roughly 150 NCAA commitments. Following the event, the league saw a spike in commitments later during the regular season and playoffs, which also included an impressive showing of 74 commitments following the conclusion of the Robertson Cup Championship in mid-May. It is a reflection in the popularity of the league-wide events, which include the NAHL Showcase, the NAHL Top Prospects Tournament and the NAHL Robertson Cup Championship, which all annually see hundreds of NCAA and NHL scouts at each event during the season. All of the NAHL coaches, who had their head coaches’ meetings this summer in Dallas, Texas, during the NHL Draft, were also complimentary of the way their players develop and their commitment to hard work. It was a major talking point at the meetings and part of a continued commitment among all of them that is focused on a common mission revolving around their player’s development and advancement. Part of that commitment to their players was that they all attended the NHL Coaches' Association Global Coaches’ Clinic. The event provided education to all of the NAHL coaches through a variety of presentations and small-group sessions conducted by NHL coaches. “It starts with all the people involved. There is a passion among the owners and coaches about what they do. They care about the kids and the programs. We see that first hand and it shows with the product on the ice. The coaches are the ones that strive for daily success and keep pushing the players to be the best they can be and players know if they buy into that, an NCAA commitment is very possible,” said Janesville Jets head coach Gary Shuchuk, who is also a former NCAA Division I assistant coach, formerly with the University of Wisconsin. “The amount of commitments is pretty special. It makes your feel proud to have witnessed the growth that has taken place the last 10 years. The opportunity the players are getting now is second-to-none and the feeling of the NCAA coaches echoes that sentiment,” said Bismarck Bobcats head coach Layne Sedevie. “The amount of exposure our players get is invaluable and to me, that’s how we convince them that the NAHL is the place to be. They get so much exposure, everywhere, and it lasts all season,” said Odessa Jackalopes head coach Greg Gatto. Now in his 12th season at the helm, NAHL Commissioner and President Mark Frankenfeld has grown the NAHL to 24 cities in 14 states with 300+ NCAA commitments every year. 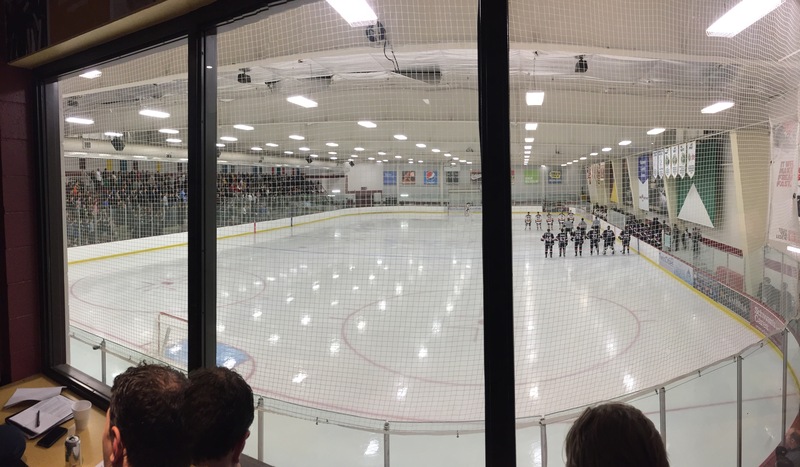 The Super Rink in Blaine, Minnesota, will host the 16th annual NAHL Showcase in late September, which annually sees 350 NHL and NCAA scouts during the event in front of packed stands. 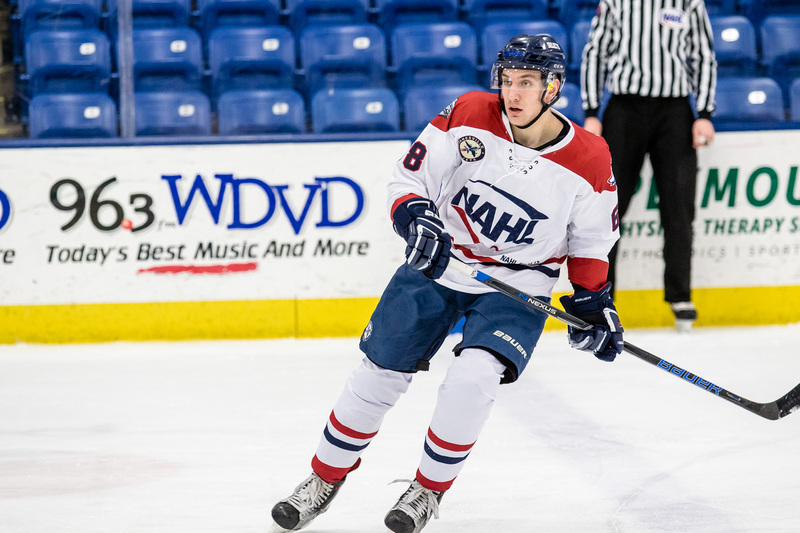 NAHL MVP and Janesville Jets forward Jakov Novak was one of nine players with NAHL experience selected in the 2018 NHL Draft this past summer. He was selected by the Ottawa Senators and will play NCAA Division I hockey at Bentley. 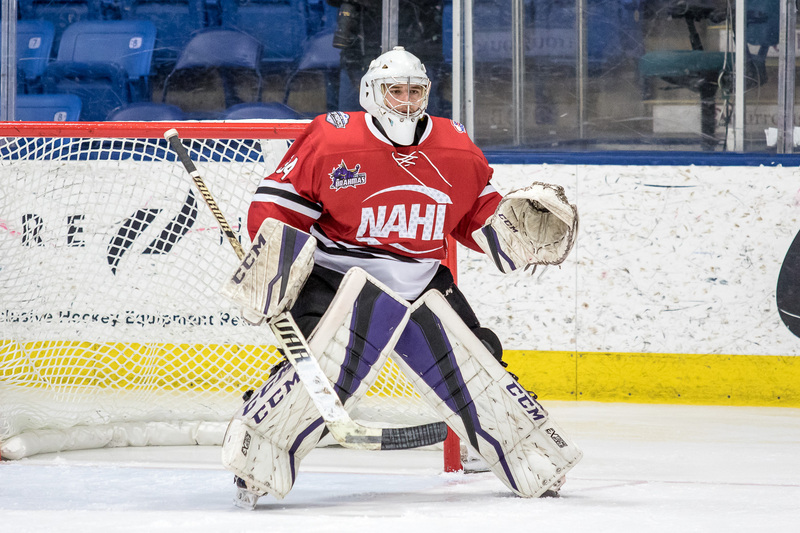 NAHL Goaltender and Rookie of the Year Mitchell Gibson was one of nine players with NAHL experience selected in the 2018 NHL Draft this past summer. He was selected by the Washington Capitals and will play NCAA Division I hockey at Harvard.